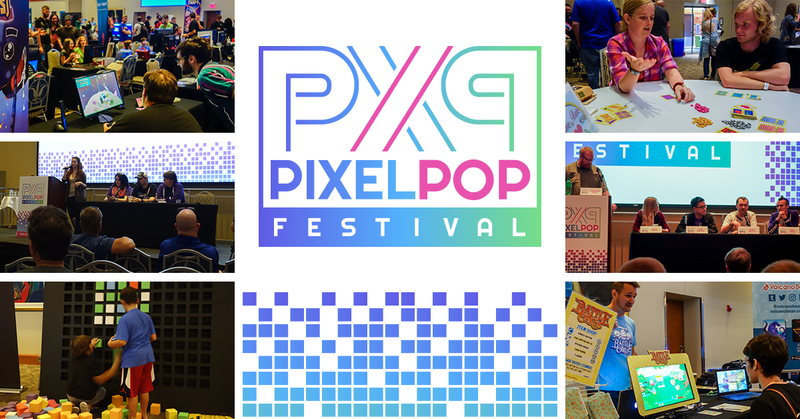 I’m the Executive Director of PixelPop Festival, a 2-day festival celebrating unique games and the people who make them — it’s the first event of its kind in St. Louis, MO. In partnership with Mary McKenzie of Volcano Bean and some incredible local collaborators, we put on a creator-friendly event that encourages education, experimentation, and equity in the industry. In its first year, I led a successful Kickstarter campaign to get it off the ground, and since have spent my time with the festival to ensure that it’s as creator-friendly as possible. Since its inaugural event in 2014, PixelPop Festival has asserted its identity as a small but impactful game festival, and has grown to accommodate attendees of many backgrounds, disciplines, and creative styles. PixelPop Festival’s mission is to encourage and empower attendees from all experience levels to develop new skills, explore different methods, and cultivate relationships with other creatives. PixelPop Festival creates a safe, approachable space for all attendees, exposing players and creators to a supportive, inclusive, and diverse culture that celebrates a wide array of games and creators. In order to continue the festival’s momentum and push to encourage diversity and accessibility in the interactive arts, programs at PixelPop Festival will encourage attendees to think progressively, have confidence, and push themselves to create thoughtful work they can be proud of.